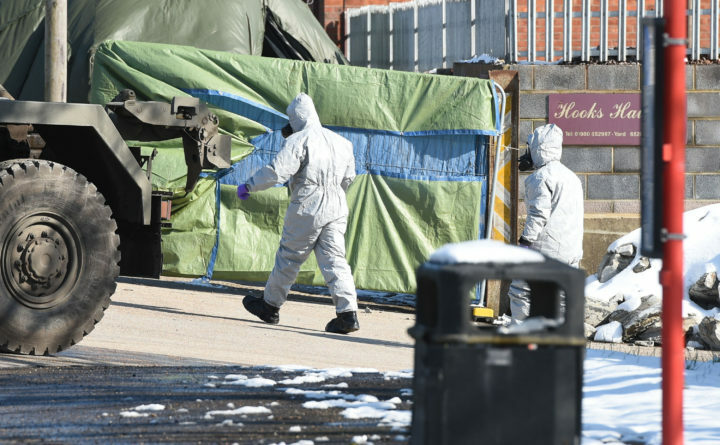 Police in protective suits exit a yard on Larkhill Road in Durrington, Salisbury, as part of the investigation into the suspected nerve agent attack on Russian double agent Sergei Skripal and his daughter, Yulia, March 19, 2018. LONDON — The international watchdog agency that monitors the use of chemical weapons said Thursday that its independent investigators had confirmed Britain’s assertions that the chemical used to poison former Russian double agent Sergei Skripal and his daughter was a military-grade nerve agent known as Novichok. The Organization for the Prohibition of Chemical Weapons sent a team to Britain from March 21 to March 23 where they took blood samples from Yulia and Sergei Skripal and the Salisbury police officer and first responder Nicholas Bailey. British officials, speaking on condition of anonymity to discuss the case, said that the high purity of the chemical points toward its creation in a sophisticated laboratory. Britain said that Russia — in violation of chemical weapons treaties — has produced the Novichok class of nerve agents in the last 10 years. The report comes a day after Yulia Skripal, 33, said that she had a “a totally different life than the ordinary one I left just over a month ago.” She was recently discharged from Salisbury district hospital, where her father Sergei remains “seriously ill,” she said. Yulia and her father Sergei, a former Russian double agent, were found March 4 slumped over on a park bench in Salisbury, a quiet city in the southwest of England.